The Central Plan amount is shrinking while Central Assistance is increasing – the 2014-15 budget paper analysis points to this fact. While the total plan expenditure has slightly increased this year (2014-15), the share for Central Plan is on a decrease while Central Assistance to state plans has increased. After the restructuring of Centrally Sponsored Schemes, the funding pattern of government too has changed. The Indian Government expenditure can be broadly divided into two categories – Plan Expenditure and Non Plan Expenditure. Plan expenditure is as per the recommendations of Planning Commission as outlined in the Five Year Plans. The total plan expenditure (5.75 lakh crore in 2014-15) has two parts. Central Plan Budget Support (2.36 lakh crore in 2014-15). (Additional) Central Assistance to State and UT Plans (3.38 lakh crore in 2014-15). NB: From 2014-15 onwards, various Centrally Sponsored Schemes (CSS) are part of Central Assistance. Earlier there were different heads like CSS, Additional Central Assistance etc. What was the split of the Plan Expenditure during last year (2013-14)? Central Plan was Rs. 3.56 lakh crore and Central assistance to state plans had amounted to Rs. 1.19 trillion and out of total plan expenditure of Rs. 4.75 trillion in 2013-14 (RE). The central plan outlay includes additional resources apart from the budget support (2.36 lakh crores in 2014-15). These additional resources come from IEBR of PE (Internal and external budgetary resources of public enterprises. (2.47 lakh crore for 2014-15). The total central plan outlay was decreased in the 2014-15 budget to cut the fiscal deficit, but Central assistance to states and UTs is on an increase. 126 CSS have been restructured in 66 schemes which include 17 flagship programmes. In BE 2014-15, funds have been provided under these schemes as Additional Central Assistance to State Plan. A much higher allocation of Rs. 3,38,408 crore in State Plan 2014-15 against BE 2013-14 of Rs.1,36,254 crore reflects this change. Ministry of Road transport and highways. Remember that these are different from CSS which are connected with the central assistance given to states. The states and UTs would now get 59 per cent of plan budget allocation, more than twice their share in FY14, whereas the share of Central Plan in plan account disbursement would drop from 75 per cent to 41 per cent. The government restructured the Centrally Sponsored Schemes (CSS) from BE 2014-15 (Plan). Accordingly, 126 CSS have been restructured in 66 schemes which include 17 flagship programmes. In BE 2014-15, funds have been provided under these schemes as Additional Central Assistance to State Plan. From 2014-15 Budget, fund allocation for almost all Centrally Sponsored Schemes like MGNEGA comes under the head Additional Central Assistance To States and UT Plans. Note: Planning Commission is governed by Gadgil-Mukherjee formula for normal central assistance. The Gadgil-Mukherjee formula envisages that special category states get 30% of all central assistance. Of that, 90% is provided in grants and 10% in loans. For general category states, the ratio of grants to loans is 70:30. Central Assistance Schemes – with many sub-categories like Normal Central Assistance(NCA), Special Central Assistance(SCA), Additional Central Assistance(ACA) etc. Central sector schemes are 100% funded by the Union government and implemented by the Central Government machinery. Central sector schemes are mainly formulated on subjects from the Union List. Central Ministries may also implement some schemes directly in States/UTs, but resources under these Schemes are not generally transferred to States. (Fund from Union, implementation by union, list – union). Restructured-Accelerated Power Development and Reform Programme (R-APDRP). NB: For these Central Sector schemes, the funds are provided to the Implementing Agencies routed through REC and PFC to the State on a project level basis. Hence, these two schemes are classified under additional central assistance schemes too. Under Centrally Sponsored Scheme (CSS) a certain percentage of the funding is borne by the States in the ratio of 50:50, 70:30, 75:25 or 90:10 and the implementation is done by the State Governments. Centrally Sponsored Schemes are formulated in subjects from the State List. In case of CSS, the budgets are allocated under ministries concerned themselves and the entire process of release is also done by them. Funds are routed either through the consolidated fund of States and or are transferred directly to State/ District Level Autonomous Bodies/Implementing Agencies. (Fund from union and states, implementation by states, list – states). NB: For each new CSS/ACA/Flagship scheme, at least 25 percent of funds may be contributed by the General Category States and 10 percent of funds by the Special Category States including J&K, Himachal Pradesh and Uttarakhand. 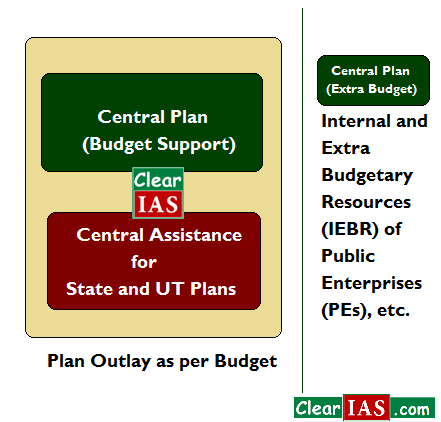 Update (2015 Feb): Centrally Sponsored Schemes (CSSs) now form a major part of the Central Assistance(CA) given by the center to states to implement the state plans. For ease of understanding CSS may now be treated synonymous to CA. There were other types of Central Assistance before 2015-16, but almost all of them are discontinued after the 14th Finance Commission recommendations for higher devolution taxes to states. As states now get more revenue via higher devolution of central taxes, the Central Assistance to state plans has decreased. Refer Union Budget 2015-16 for latest figures.